As a contributor on a document, you can notify by email any user or group defined in the permissions of the document. 1. From an AODocs document, open the More Actions menu and select Notify users. Alternatively, from a view select a document. Then open the More Actions menu and select Notify users. - Type the contact's name in the To field, the name auto-completes with users who have access to the document. - Press the See document permissions to view all users who have access to the document. enter an email subject - by default the document name is added as the subject. 4. The users and groups receive an email notification from notifications+notify@noreply.aodocs.com, containing a link to the document. 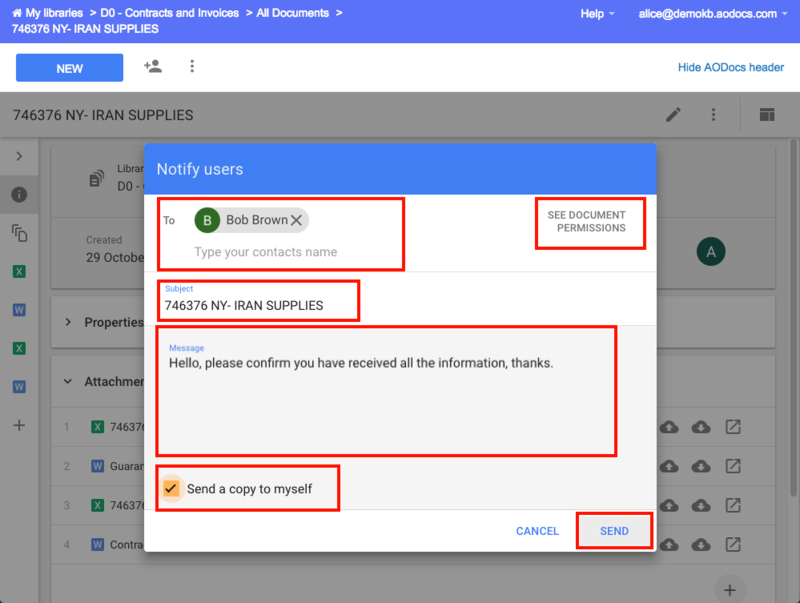 - For Secured Folder libraries and Document Management libraries, the link contained in the email notification opens the document in AODocs interface. - For Team Folder libraries, the link contained in the email notification opens the document in Google Drive. - The email notification is sent in the language set in the library's locale. Is it correct that the author of a certain document can't see this 'Notify users' option? If the author is no more a contributor (she/he has been downgraded into a reader) then that would be the case. Thanks for your comment. It's not currently possible to customize the email notification. But feel free to create a feature request on our Community pages!